Water is the last frontier in animal production. Taking water quality seriously could pay dividends with healthier birds, better feed conversions and reduced production costs, said Dr Susan Watkins from the Center of Excellence for Poultry Science at University of Arkansas System Division of Agriculture, during the 2015 Midwest Poultry Federation Convention in St Paul, Minnesota. Significant time and money are invested in creating the right production environment and with the premium price of organic feed, no stone is left unturned for ingredient and feed quality assurance programmes, Dr Watkins continued. Yet in spite of the resources invested, many organic producers spend little time and effort on water quality, the nutrient which birds consume twice as much as feed. The first step in developing a successful water programme that benefits production is acknowledging that water quality can be significantly impacted by the natural contaminants present, as well as the products often used in water supplies. The next step is to do a critical assessment of the water system to identify the areas needing improvement. Proven to maximise water quality is cleaning the system between flocks and this involves choosing the best products for line cleaning and then utilising them at the appropriate rate while the barns are empty. Finally, implementing a sound daily water sanitation program when birds are present and minimising the use of products that could be feeding or promoting pathogens is how to keep water as a production tool. One of the biggest challenges with poultry farm water supplies is the slow, sometimes stagnant flow during parts of the grow-out cycle. The water in the system can undergo temperature variations from warm to cold which can actually make some pathogens even tougher. These factors along with naturally occurring iron, manganese and sulphur as well as utilising products such as probiotics, citric acid, vitamins, organic acids, vaccines and milk replacers can lead to the development of microbial growth known as biofilm, a protected and hardy mixture of bacteria. Once established, biofilms hide pathogens and make water systems as much as 1000 times harder to clean. Drip and swab samples pulled from water lines can help identify if contamination is a problem. 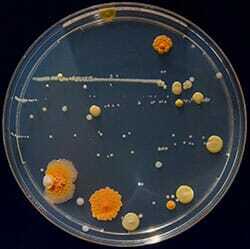 "I recommend conducting a total plate count bacteria test (as well as tests for) yeast and mould. "Counts should be less than 1000 colony forming units/millilitre (cfu/ml) for drip samples and if a swab is used to evaluate how much is living in a water line, it is recommended that the swab results should be no greater than 10,000 cfu/ml," Dr Watkins advised. The University of Arkansas has a video available to demonstrate the sampling procedure. If a mineral and pH analysis has not been done for a water supply, it is highly recommended. Knowing the natural contaminant levels of minerals such as iron, manganese or sulphur provides a great starting point for addressing the food supply for harmful waterborne pathogens such as E. coli, Pseudomonas, Klebsiella, strep, and others. 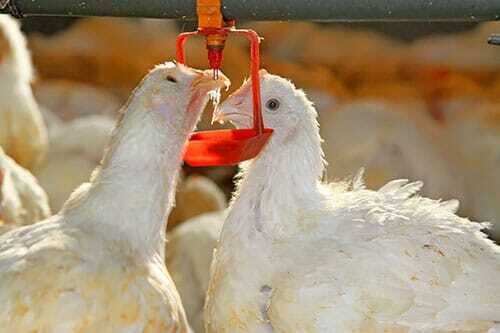 Cleaning water systems between flocks is the single most important step for optimising the quality of water. Some of the best products available for line cleaning are stabilised hydrogen peroxides used at the manufacturer’s recommended rates (2-3 per cent). It is important to note that injecting products with a medicator set at a 1:128 rate only gives a 0.78 per cent solution which has been proven to be not nearly as effective as the 2-3 per cent solutions. The next most important step is leaving the products in the lines long enough to do the job which for most is at least 24 hours. Before using any cleaner, check with the manufacturer for their recommendation. The last step in successful line cleaning is flushing the lines with water that contains a sanitiser level that is acceptable for the birds to drink. This helps to assure that if any biofilm was not eliminated by the line cleaning, it will not have an opportunity to re-establish or pass to the birds. Dr Watkins said: "I am often asked how much of the system should be cleaned. We have learned that as much of the water distribution system as possible should be cleaned, even underground distribution lines running from well rooms to the barns. These areas have proven to be sources of health challenges flock after flock." It may take line cleaning several times between flocks before all challenges are eliminated so do not get discouraged if immediate benefits are not achieved after the first line cleaning. The last step is to minimise the use of water additives and focus as much as possible on maintaining a good daily water sanitation program with the birds present. Products such as citric acid or vitamins can promote microbial growth leading to health issues. If using these products is an important part of your operation, take time to check for bacteria and mould growth in water after these are used so you will know if the products are helping or hurting your performance. There are several products which can be used for daily water sanitation including hydrogen peroxide which should be mixed and injected at a level that provides 25-50 ppm of residual to the birds. Silver Bullet uses the Advanced Oxidation procedure and breaks down to water, oxygen and low levels of hydrogen peroxide. Best use of this system is infusion into a holding tank or well aquifer. With the cost of production on the rise, Dr Watkins advised not to throw away performance because of lack of attention to water.